Sound Cards and PC Sound Production - PC Buyer Beware! This section of this website provides detailed information on internal and external computer sound cards and sound production by speakers and headphones. If you are looking for information about the installation of a sound card visit the Installing video/graphics and sound cards page of the Build Your Own PC section of this website. If you only use a desktop or laptop PC that provides the sound ports from its motherboard – called integrated sound – instead of a sound card – and stereo speakers, there isn’t much to sound production, but a surround-sound setup for an entertainment media center or gaming computer is more complicated. In any case, when everything has been set up and is working, computer sound production is not very problematic.The image below shows the connection ports of a motherboard that appear at the back of the case and the devices they connect, including the built-in audio ports used by the motherboard’s sound chip. Asus F1A75-V Pro Socket FM1 motherboard’s ports panel showing the audio in-built ports. Click on the image to view its full size. If you want to install a sound card or video card on to a motherboard that is presently using a sound chip or video chip that is built into the motherboard, you have to disable the onboard sound/video first. This can be done via a setting in the UEFI/BIOS setup program (the most common way), or by setting a jumper on the motherboard itself. The information on what to do is contained in the motherboard’s manual, which you can download from its manufacturer’s site if you don’t have a copy. Go to the first Motherboard page on this site on how to identify a motherboard if you can’t identify the one installed in your computer. If the integrated sound chip is listed in the Device Manager (e.g., Realtek AC’97 Audio), it can be disabled from there by right-clicking on the entry with the mouse pointer over it and then clicking on Disable on the menu that presents itself. Sound problems very rarely appear on computer web forums and in the problems sections of computer magazines, so a separate problems section has not been created on this website, as is the case for the other major PC components, which can be accessed on the PC Problems & Solutions section of this website. The most common sound problems are dealt with here. Look for them under the Contents menu at the top of the page. As you can see from looking at any of the diagnostic charts made available from the following link, there are no photo-illustrations or explanations of basic computer functions. The intended audience is the hobbyist or technician who already has some experience of repairing computers. If you can understand a particular flowchart, it would be a good idea to print them just in case you can’t boot your computer and you need the information. Every sound card or sound chip integrated on a desktop or laptop PC’s motherboard installs a sound control panel when its device drivers are installed that adds to the sound options provided by Windows 7/8.1/10. The image below shows the sound entries in the Windows Device Manager for a laptop computer that has a Realtek sound chip (the entry for which is highlighted) integrated on its motherboard instead of as a separate sound card. The entries would be much the same for a computer that has a separate sound card. A double-click opens the window showing each entry’s information and options. A right-click on each entry for a device allows you to update the driver and disable or uninstall the sound adapter. If you uninstall the sound adapter, Windows reinstalls the device drivers the next time the computer starts up or is restarted. Just doing that fixes most sound problems. Alternatively, you can download and install the latest device drivers from the sound-adapter manufacturer’s website. Below is an image of the Realtek sound control panel for the Realtek High Definition Audio device, shown highlighted in the image of the Windows Device Manager, above, that is called Realtek HD Sound Effect Manager in the Windows Control Panel from which it is accessed. The controls are usually all self-explanatory and you can experiment with them. A separate sound card will also provide a control panel. There is plenty of software available that makes it possible to edit sound files, much of it free, open-source. For example, you might want to remove the vocals or the music of a music file. The best freeware sound editor and recorder is Audacity. When you play video or sound files on your PC, Windows, or an alternative operating system, such as Linux, uses a media player, such as the Windows Media Player, VLC Media Player, Quick Time Player, Real Player, etc. Raw movies and video would take up enormous amounts of hard disk space, so they are compressed to make the files smaller. This is essential if they are downloaded or streamed in real time to a computer. Mathematical algorithms called codecs, a word made up of the first two letters of the word compressor and the first three letters of the word decompress or, compress the files and decompress them when they are played. It is possible to download and install free codec packs. The most popular free pack is the K-Lite Codec Pack, available from many download sites – a comprehensive selection of codecs that guarantees that a PC can play almost any video or audio file. You can find links to other articles on codecs by using a suitable search query. I found the link above by using this search query: codecs windows media player. The myriad of cables that are in use are often very confusing to the home computer user. The following link provides a slide show of the cables and information on what each cable is used for that should dispel most of the confusion. The sound in a high-end desktop PC is usually produced by a PCI or PCI Express (PCIe) sound card (also known as an audio card) that is installed on the computer’s motherboard in an adapter slot, an example of which is shown in the image below. PCI sound cards are still widely available, but most are PCI Express cards that can fit into a x1, x4 and x16 PCIe slot on a motherboard. The manufacturer provides the device drivers that come on a disc with the card. The latest drivers can be downloaded from the manufacturer’s website for a particular model. Windows 7/8.1/10 can also install the drivers via the Windows Update site. From reading the purchaser reviews on Amazon, I found out that it is possible to install that particular card (£66 in February 2016) in a PCI Express (PCIe) x1, x4 and x16 motherboard slot, but it is best to install it in the shortest x1 slot. As you can see in the image, it has a short connection edge that fits the x1 slot. The Amazon description of the card did not say which PCIe slot(s) that it can be installed in, which is often the case on vendors’ sites. You have to find out yourself. Sometimes even the manufacturer’s site does not provide that information. However, the card’s manufacturer is Creative and this information is on its specifications page for the card: Available PCI Express (x1, x4 or x16) slot. A user manual for the card is also available from the site. Technical documentation – guides and user manuals – are usually provided as PDF downloads (requiring a PDF reader) from the sound-card manufacturer’s or motherboard (for integrated sound) manufacturer’s website. The PDF downloads are usually 6MB+ in size. 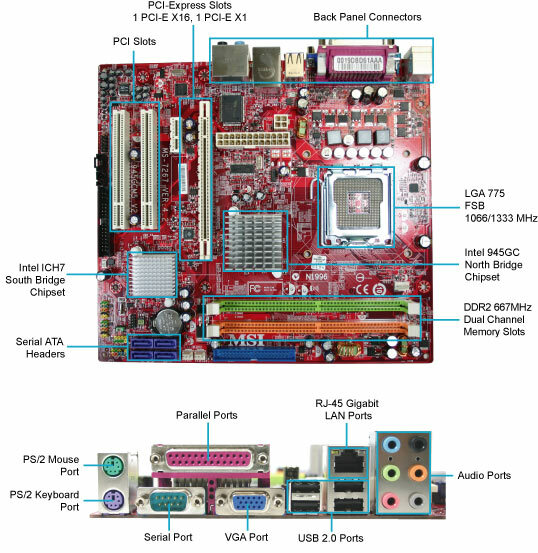 Visit Annotated Images of ATX Socket LGA775, Socket A and Socket 939 Motherboards for information on the motherboard adapter-card slots, connectors and ports. 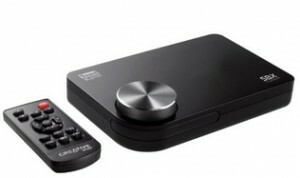 The sound card, in turn, is connected to other peripheral devices that can deliver sound, such as a CD/DVD/Blu-ray optical drive, in order to produce sound via the operating system, which uses the card’s software device driver and a sound player, such as the Windows Media Player (WMP), or a third-party media player, which is usually free, such as the VLC Media Player (my preference), Winamp, Real Player, or Apple’s QuickTime. Using an inexpensive PCI Express or PCI sound card, which requires a free PCI Express or PCI slot on the PC’s motherboard, with some decent speakers can improve the sound production dramatically compared to the sound produced by the onboard sound chip provided by many motherboards. In this regard, sound cards are similar to graphics cards: the cards, even the inexpensive ones costing around £30, provide a superior user experience compared to the sound or graphics produced from chips on the motherboard – called integrated sound – which, it must be said, have improved greatly over the years. A laptop PC usually has a built-in sound card or, more commonly on the less expensive makes/models, a motherboard that has a sound chip. The sound quality can be very good, good or not so good. However, cheap USB sound cards or sound devices that plug into the lime-green line-out audio I/O ports or use Bluetooth or Wi-Fi wireless connectivity can be purchased that are an improvement on the sound produced by the built-in speakers. Visit the x-mini.com site for examples of the latter kind. Most laptops and some desktop-PC motherboards that provide integrated sound only provide three connectors, usually coloured blue (Line-In), pink (Mic) and lime-green (Line-Out), which can’t provide 5.1 surround sound at the same time as inputting audio from the line-in and microphone jacks, they switch inputs for outputs, depending on whether the speaker configuration is set to 2.1 stereo of 5.1 surround sound. Therefore, six output sound ports are preferable when connecting surround-sound speakers. The Line-In port is used for external CD player, tape player or other audio devices. Line-Out is a connector for speakers or headphones. The Mic port is a connector for a microphone. The three other output ports are for surround-sound speakers. – RS-Out (Rear-Surround-Out) in 4.1/ 5.1/ 7.1 channel mode. CS or SS-Out (Center/ Subwoofer Out) in 5.1/ 7.1 channel mode. The image below shows a cheap but effective and well-reviewed USB external stereo sound adapter. It provides a pink microphone socket and a lime-green line-out for headphones or an x-mini external speaker. 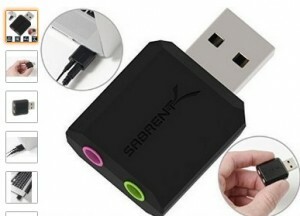 Sabrent USB External Stereo Sound Adapter (£6) for Windows and Mac. Sound cards range in price from £2 for a basic USB sound card dongle, shown above, to internal or external USB sound cards priced up to £200. A web-search for Asus and Creative sound cards will provide a good idea of what is available. 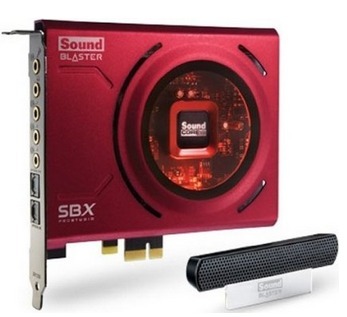 The creative Sound Blaster ZxR PCIe Audiophile Grade Gaming Sound Card (£170 in February 2016), that can fit in a PCI Express x1, x4 or x16 motherboard slot and comes with a second card that just requires a free slot in the case and an external audio control module. The online reviews of sound cards and sound peripherals devices, such as headphones and speakers, are not as plentiful as they used to be and many sites have not added reviews for years. For example, Tom’s Hardware no longer provides reviews or information on sound hardware. That said the following review sites are the best that I could find. Amazon sites sell the sound hardware and their purchasers tend to provide very useful reviews. ReplayGain is a tagging standard that encodes volume normalisation data in audio files, which allows the volume at which each track is played at to be adjusted automatically to achieve the same perceived playback loudness, thereby avoiding having unexpectedly loud and quiet tracks in a playlist. The following webpage provides information on this standard and its implementation with different audio files. Foobar 2000 (freeware) is an advanced media player that tags audio files correctly so that they can ReplayGain can be applied to them when played. A Musical Instrument Digital Interface – MIDI – is required in order to connect a musical instrument, such as a Roland RD170 Piano Keyboard. On a PC, you can make use of a USB MIDI device, such as the Roland UM-ONE mk2 USB MIDI Interface. The PC used to produce the music should have the correct sound production software package(s) installed. Sibelius and Transcribe are available for both Windows and the Apple Mac platforms. There are many more such packages that you can identify and research by making use of a search engine. You can also use it to find information and vendors for any of the products mentioned above. Video streamers are widely available and it is also possible to buy dedicated audio streamers (audio streaming devices), which work in the same way as a video streamer, but only serve sound in one room (usually the living room) or to any room in a house set up with a set of wireless or wired speakers. For more information on streamers read the article on this site called: Media Steamers and Audio Streamers/Audio-Steaming Devices. 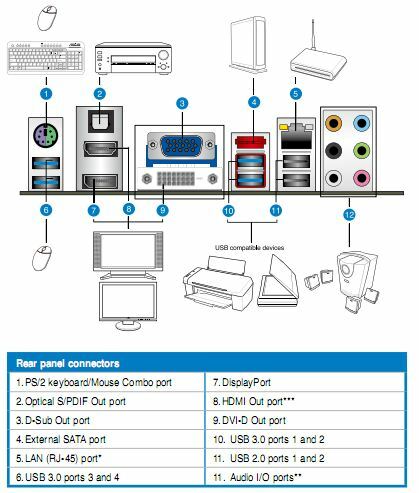 Most LCD monitors now have extra video connections that allow them to be connected to a DVD player, games console or video camera (component, S-video, and composite video ports). Most LCD monitors now also provide one or more HDMI high-definition ports and support High-bandwidth Digital Content Protection (HDCP), which is the content-protection technology that allows them to display the latest high-definition movies. Most HD TVs also have one or more HDMI/DVI ports that allows them to be connected to a PC’s motherboard, graphics card, gaming console, etc., that also has an HDMI/DVI port. However, note that if you are only using a 2.1 stereo speakers for the sound output, you will only get two-channel simulated surround sound from them. 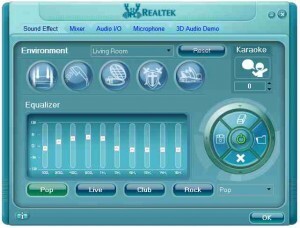 A 5.1 or 7.1 surround-sound speaker system is required for actual surround sound. By February 2016, there was not yet an official standard for wireless HDMI, but some products have been made available that provide wireless 1080p video using an 802.11n wireless transmitter. An example of such a product is the Eminent iTrio EM7100 wireless home HDMI kit. HDCP stands for High-bandwidth Digital Copy Protection, which is technology that allows the monitors that support it to authenticate themselves to high-definition video sources, such as a high-definition movie, thereby proving that they are an approved method of displaying the video rather than an illicit device that could be used to copy it. The digital copy protection is implemented digitally only, so if you buy a monitor that has a standard analog D-sub VGA graphics connector, you won’t be able to watch HDCP-protected high-definition Blu-ray movies. HDCP was developed by Intel. It encrypts the signal between the HD video source (the high-definition Blu-ray or HD DVD player/drive) and the display/monitor. Digital output from a Sky HD box, Blu-ray, or HD DVD player will not be displayed if the DVI or HDMI input on the monitor isn’t HDCP-compatible. There are different standards of stereo and surround sound that a sound card is capable of producing – and then only if set up with the proper number of speakers properly placed around the computer. The sound standards have been given numbers that currently range from 1.0 to 7.1 sound, and you must have a sound card and speaker system that supports a specific standard if you want to create that level of sound production. Most music sources are still in stereo that is supported by sound cards that support 2.0 sound – even though the availability of DVD audio – Dolby Digital or DTS 5.1 – is increasing and can be played on a PC with the right sound card. So, if stereo playback is all you want, what you need is a system that will play a stereo source properly. Note that upmix is a term that means artificially creating or simulating a particular higher standard of sound production on a sound system that doesn’t fully support it. For instance, stereo sound could be upmixed to make it play on a multichannel system. And a downmix would be the reverse of that: the simulation of a lower standard of sound on a higher system, such as stereo. Upmix/downmix technology refers to the software and/or hardware that can create upmixed or downmixed sound. For stereo, the basic formula that is closest to the original recording is the playback supported by standard 2.1. But now, with Dolby Prologic II, the more recent Dolby Prologic IIx (7.1 upmix) or the Creative CMSS system, you can upmix stereo to multichannel output. It’s true that the exactness of the original recording is lost, but the result is usually pleasing if the parameters are carefully chosen. To use a multichannel system, it has to be properly hooked up to a sound card. You should have no problem with a 5.1 system, which has the standard inputs of three 3.5mm stereo jacks. But if you only have a 5.1 sound card and buy a 6.1 or 7.1 system, you’ll be offered an “upmix” to use all of the channels with a 5.1, or even with a 4-channel sound card. The problems begin with 6.1 and 7.1 sound cards, because some of them, like cards from Terratec, use stereo jack sockets, while others, such as cards from Creative, use four-pin jack sockets. Therefore, before you buy a sound card and set of speakers, remember that getting everything properly plugged in can be problematic. It’s regrettable that, as yet, the sound card and speaker manufacturers haven’t agreed on a universal standard for a complete sound system. To make sure that you can create the mix that you want, you’re advised to download and read the user manuals and reviews for sound cards and speaker systems before you make a purchase. There are also plenty of tutorials and guides on the web on how to set up the various kinds of sound systems that you can find by using a suitable web search query in a search engine. PC speaker systems usually consist of the internal laptop or external Desktop speakers. External speakers can use an amplifier that powers them. A set of PC speakers can be powered by their own mains power supply unit or can be powered via a USB connection if they don’t drawn more power than a USB connection can provide or the smaller speakers can be powered by a rechargeable battery and connect to the headphone port of a sound card or laptop PC. A set of speakers can cost between £5/$10 and £300/$600. An ordinary multimedia PC system always comes with a set of stereo speakers that may be separate from the PC or built into the monitor. If you are building your own PC, you would purchase the kind of sound card and set of speakers that are required to deliver the quality of sound that you want of your PC. Wireless Bluetooth speakers are available. Search online for: Best Bluetooth speakers. They come in indoor and outdoor types, so add outdoor or indoor to the search. The speakers designed for outdoor use are usually waterproof and shock-resistant. 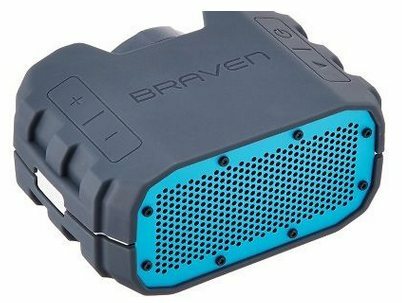 Priced at £40 in August 2016, the Braven BRV-1 wireless Bluetooth outdoor speaker system, shown below, is water-proof, shock-resistant and is enclosed by robber bumpers. A recent development is called a soundbar, which is a miniature set of 2.1 stereo speakers arranged in a bar. The Orbitsound M9LX Soundbar with wireless Bluetooth Speaker is a good example. The Orbitsound T9 soundbar is very small and comes with a separate subwoofer that deals with the bass sound and an integrated charger that can charge an iPhone or iPod. The device provides stunning audio that has eliminated the sweet spot where optimal sound can be heard, making it possible to have the same quality of sound all around a room. If you want to edit or transfer sounds from your PC to other equipment, such as a MiniDisc or MP3 player, you’ll need a fairly expensive sound system that provides the connection to do that. Note that the specifications of speaker systems don’t usually provide much in the way of useful information about them and the price of a set of speakers doesn’t have to bear any relation to the performance that they deliver. That said, the first feature you should look for is a subwoofer, which handles the bass frequencies. The speakers themselves output the mid- and high-frequency sounds. A subwoofer produces omni-directional sounds (spreading all around), so it can be placed almost anywhere in a room except in a corner where the resonation creates an undesirable boom effect. The low bass frequencies produced by subwoofers carry plenty of energy and, as such, can be heard through couches and other furniture, so they can’t be placed anywhere in a room for the best audio effects. But some placing are better than others depending on the shape and size of the room. Probably the worst placing is in the middle of a room. Better to have it near a wall or in a corner if being there doesn’t create a boom effect. I find that the best position for a sub in my sitting room, which has the lounge suite in the middle with plenty of space all around, is to have it in corner at the back of the main couch, which faces the TV. You have to experiment with your own room where best to situate it for the best audio. The stereo speakers that most laptops, netbooks and tablets provide are adequate for most users’ sound needs, but if you want high quality audio, you should buy a set of external speakers or headphones. The speakers can be a large self-powered set or a small portable set. Some laptops are now provided with a subwoofer to improve the bass sound. A genuine subwoofer has to be placed in the best position in a room in order to produce the best bass sound, which cannot be achieved from a laptop with a third speaker that attempts to behave in the same way as a genuine subwoofer. For acceptable audio quality when playing PC games or DVDs, you should have a surround-sound system, delivered by a standard 5.1 setup, which consists of five speakers and one subwoofer. However, for the best sound quality, you should use a set of the latest 6.1 or 7.1 speakers, plus a compatible sound card that supports the extended Dolby Digital EX format. To obtain the best surround-sound reproduction for movies and games, the speakers have to be positioned optimally. Reading an illustrated article on positioning the speakers is always better than reading an non-illustrated description. Fortunately, there are many such articles on the web that can be found by using a web-search query such as: best positions for surround sound speakers. The power of a set of speakers can provide you with an idea of the maximum volume it can deliver. You should ignore the PMPO or Peak Power ratings, which can be up to 40 times higher than the RMS rating, which you can use. A 50W RMS sound system should provide more than enough volume for a desktop PC. However, if the sound system is for use with a home cinema, look for 100W RMS, or more. 2.1 stereo speakers use a single analog stereo input connection to the sound card, but a 5.1 system requires three connections to the sound card. Surround-sound systems that incorporate Dolby Digital decoders have to be fed through an S/PDIF digital audio connection, which comes in coaxial and optical versions, which are incompatible with each other. However, note that Dolby Digital decoding can be done by software instead of the hardware (the sound card), so you can use surround-sound speakers with analog inputs, which is cheaper than using a digital solution. The speakers are usually connected via the audio ports of a sound card, or via audio ports built into the motherboard that connect to its sound chip. The sound features provided from a motherboard sound system are usually basic. However, a sound card can provide a PC with everything its user may require with regard to connecting the PC to external sound equipment, but the more that is required of a sound card, the more expensive it has to be. The image above shows a basic set of stereo speakers, and the image below shows three 5.1 surround-sound systems, which have five speakers. Some of them can be controlled by a remote control that is provided in the package. Very few music CDs offer multi-channel sound, but some sound cards can convert a stereo signal into a 5.1 surround-sound signal. Virtual Dolby Surround is an example of audio technology that is supposed to enable two speakers to sound like five, but in practice it doesn’t deliver anything like the same quality of sound as the real thing. While music DVDs offer multi-channel sound, they’re still difficult to find. However, most DVD films and many games use 5.1 surround sound, and for those 5.1 system is necessary to achieve the full sound experience. Indeed, the surround-sound experience requires speakers to be located in front, behind, and on the side of the listener, which necessitates at least 5.1 speakers. Remember that the higher, more expensive 6.1 and 7.1 sound systems are available. For a basic sound card that is connected to two speakers, they are usually plugged into the sound card’s Line Out or Speaker Output sockets via a single connector, as shown in the sound card’s manual for a boxed retail PCI or PCI Express card, or as shown in the motherboard’s manual if the sound chip is built into the motherboard. Note that OEM (Original Equipment Manufacturer) cards (or any other PC component) that are supported by the vendor instead of the manufacturer, will probably only be packaged with a driver CD (no manual). In this case, you should be able to download a manual from the manufacturer’s website. The diagram below, from an MSI motherboard manual, shows the port face of a motherboard that has an integrated sound card with only three ports – Line Out, Line In, and Mic. (for a microphone). A basic PCI or PCI Express sound card usually has these three ports plus a Speaker Output port. On the motherboard with this ports panel, the Line Out port is used for the speakers and headphones, the Line In port is used for an external CD player. A more advanced sound card would have ports for front and back surround-sound speakers. You can download the user manuals for the latest MSI motherboards free of charge from msi.com. Some high-end, relatively expensive sound cards can not only decode surround sound, they also have optical digital input and output ports that make use of fibre-optical cables for digital data transfers. Fibre-optical cables carry signals in the form of light waves much in the same way that a laser beam of light transfers data to and from CD and CD recordable discs. Digital data transfer means that the digital peripherals (sound card and speakers) are able to take output or input data directly in binary form from or to the computer instead of having to convert the input/output into analogue/analog (non-digital) forms. Digital binary input/output consists of software coding that is made up of only ones and zeros. The data transfers within a computer are all in digital form, but before the advent of digital peripheral devices, most of a computer’s devices had to convert the computers digital signal into analogue signals and convert their analogue output into digital form before sending it to a computer. For instance, digital monitors (old-style CRT and the latest LCD monitors) communicate directly with the computer’s video card, but an analogue cathode ray tube (CRT) monitor has to have an electronic analogue-to-digital converter (DAC) in order to receive or send signals to a computer, but a digital liquid crystal display (LCD) screen communicates directly with the computer. Sound cards that are more expensive than the basic ones with three or four ports – Speaker Output, Line Out, Line In, and Mic In – have extra audio input ports for TV tuner cards, CD/DVD drives and other external sound devices. A 5.1 sound system uses three inputs just to be able to produce that level of sound. 7.1 surround sound systems, which have Dolby Digital decoders, are fed via an S/PDIF digital input, the cables for which are available in coaxial and optical versions. You can also buy a USB adapter that provides S/PDIF digital stereo output. S/PDIF optical digital audio output connects a PC or laptop computer to the latest home entertainment equipment to provide a digital, distortion-free signal. Enter s/pdif + usb + adapter (UK: use adaptor) to locate information and vendors. S/PDIF coaxial input/output (i/o) is provided by most high-end desktop PC sound cards. The popular Sound Blaster sound cards can be connected to a Digital I/O Module to add optical and coaxial digital i/o to it. 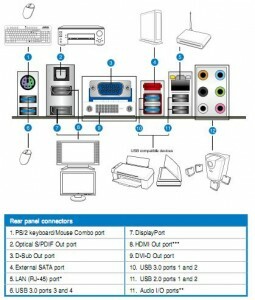 Some motherboards provide either a connection on the ports panel or a special bracket containing coaxial and/or optical S/PDIF ports that fits into an opening at the back of a computer’s case. The bracket allows its own internal cables to be attached to the motherboard and external cables to be attached to the speakers. Below is an image of the ports panel of an MSI motherboard, showing its S/PDIF-Out port. 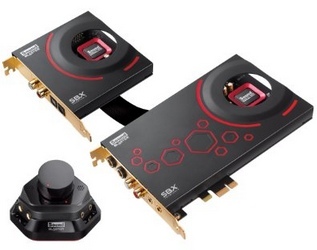 Some graphics cards provide S/PDIF input so that the card can be connected to the optical S/PDIF output port on a sound card in order to deliver sound from a graphics card over an HDMI high-definition connector, which already has the capacity to deliver audio output along with graphic output. Note that because it is possible for Dolby Digital decoding to be done by software, surround-sound speakers that use analog inputs provide a much cheaper alternative to S/PDIF digital input. Most sound cards install their software device drivers in a control panel that is within the Windows Control Panel. You don’t have to use all of the speaker ports. If you have purchased a set of two speakers, you can plug them in using the Front Speakers or Back Speakers port. But if you only want to use two speakers, you should purchase a basic sound card that has only a Line Out port for them – or purchase a motherboard with an integrated sound card. There are many such motherboards available, because the technology has been borrowed from servers that have motherboards with integrated sound cards. Most speakers will have their own power supply unit, but they should produce sound at a low volume if they are left to draw power via the sound card attachment. Most speaker systems require their own power supply unit to be plugged into a mains wall socket for optimal performance and most of them have to be turned on by pushing a switch somewhere on one of the speakers. A speaker manufacturer’s specifications for a particular set of speakers can be confusing. When comparing power ratings, the Root Mean Square (RMS) figure provides a good indication of the volume that can be delivered, because it provides a measure of the sustained power that a set of speakers or an amplifier can generate. You should not compare speaker systems by the Peak Music Power Output (PMPO) figure, which can be very much higher. You connect headphone and microphones to the appropriate input/output port (headphone, Line in or Mic respectively) of the sound card. Note that if a pair of headphones are connected to the 3.5mm headphone output port of a sound card or a laptop, a faint hissing sound might be heard. The cause is usually mismatched headphone impedance when connecting low-impedance headphones, such a those designed for MP3 players, which usually have an impedance of 32 ohms, to an output port intended to be powerful enough to power high-impedance headphones. Studio headphones have a standard impedance of 600 ohms and gaming headsets have an impedance of between 150 and 300 ohms. When the impedance of the audio output port is too low for the headphones, the sound output will be too quiet and if it is too high for the headphones, a hissing sound is produced. Better sound can be produced by using the green Line-Out port than by using the headphone output port. Alternatively, purchase a set of headphones with the correct impedance for the output port or make use of a level attenuator (e.g., Shure EA650), which is a dongle that is designed to reduce the amplitude of the signal, which makes it quieter or eliminates the hissing sound. Here are the pages for reviews of headphones and speakers on the same well-regarded UK website. There are many others by web-searching for headphone and speaker reviews. Corsair, the major PC case, memory, power supply unit, graphics card and other PC components manufacturer also manufacturers all kinds of headphones – wireless – USB – hybrid stereo/USB – analog – and a limited range of speaker systems.